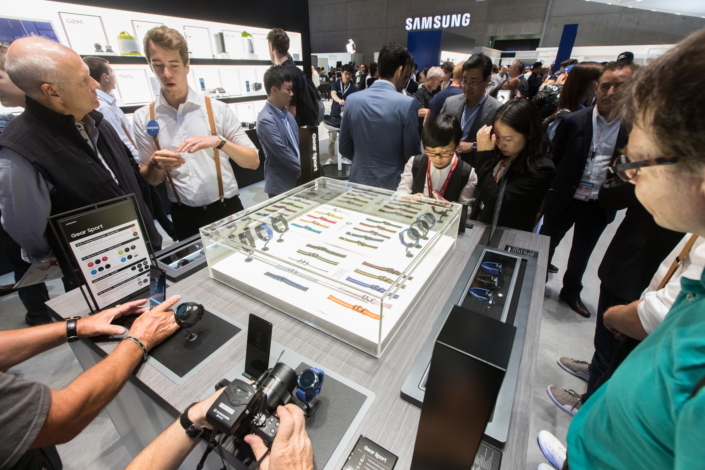 At the center of Samsung’s IFA 2017 booth are the company’s latest mobile innovations, designed to make it easy to break a sweat and do bigger things. 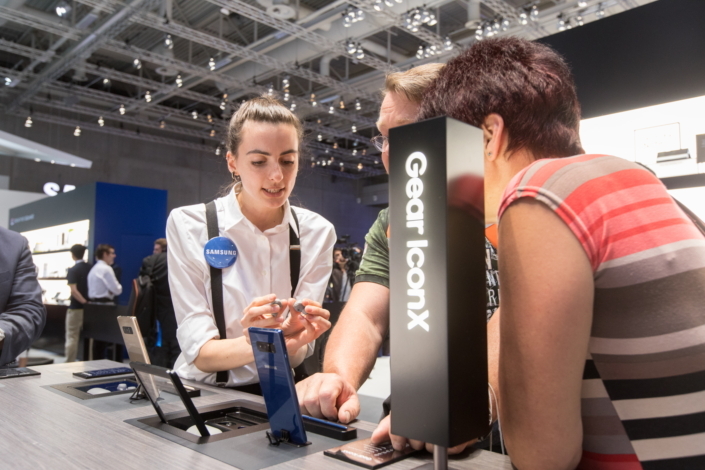 The booth features three sections – an Atelier, Gym, and Workplace – that allow visitors to get their hands on products including Samsung’s newest wearables, the Gear Sport, Gear Fit2 Pro, and the updated Gear IconX, as well as its latest flagship smartphone, the Galaxy Note8. 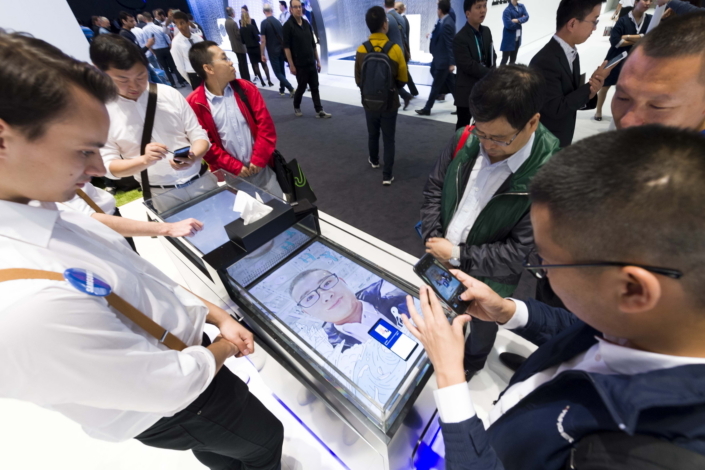 Fun and interactive exhibits showcase how the devices’ premium functions, seamless connectivity and intuitive designs introduce new aspects of convenience that become normal to users as soon as they experience them. 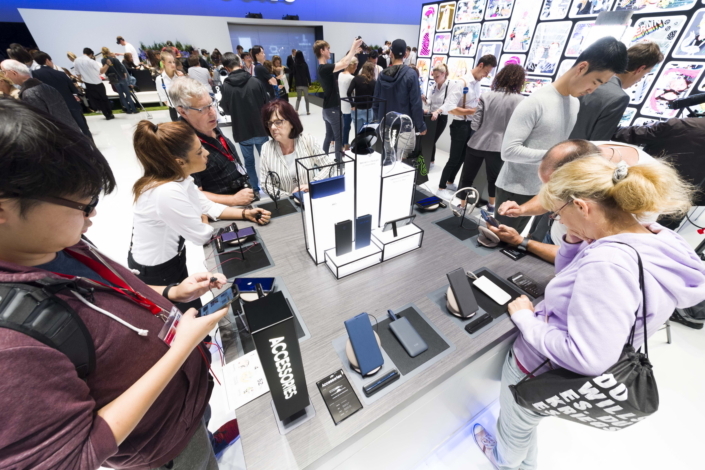 See how Samsung’s latest mobile offerings deliver your new normal in the photos below. 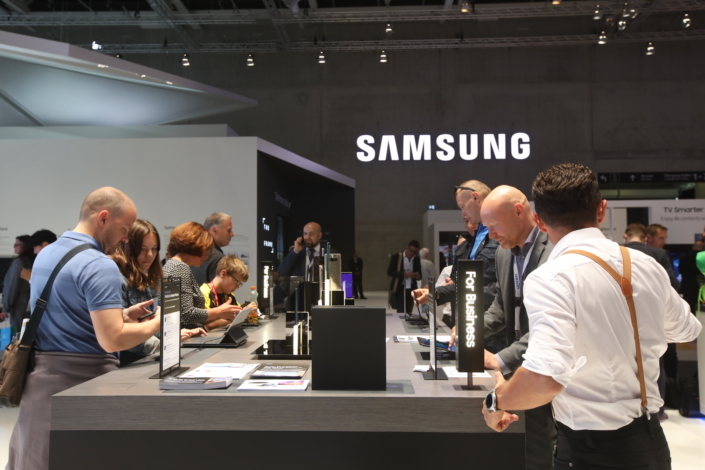 Samsung’s latest mobile offerings may be found at the center of the company’s IFA 2017 booth. The new Galaxy Note8 features an immersive, 6.3-inch Infinity Display, an enhanced S Pen, and a best-in-class dual camera with Optical Image Stabilization. 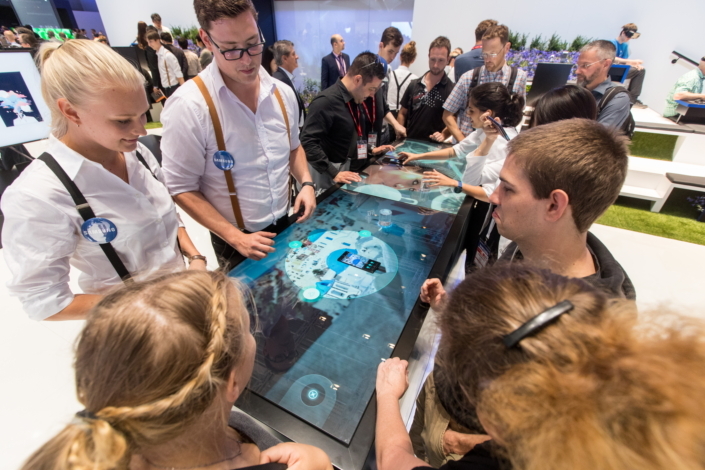 An interactive display in the booth’s Atelier offers a breakdown of the Galaxy Note8’s advanced features. 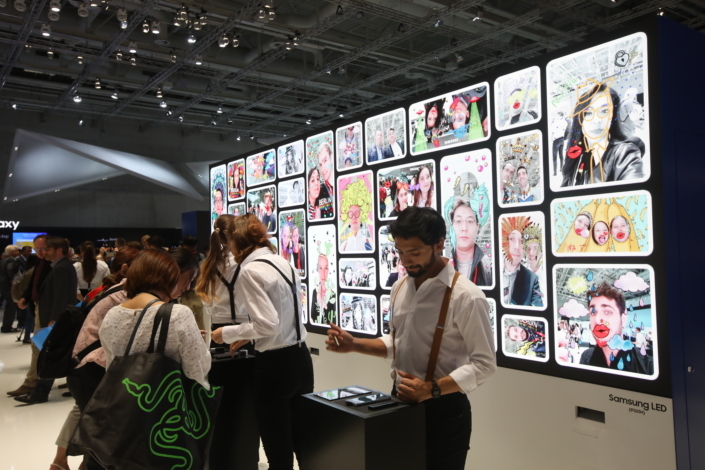 A large display exhibits a ‘digital gallery’ of selfies that attendees have snapped with the Galaxy Note8 and decorated with fun stickers and animated text using the device’s S Pen. 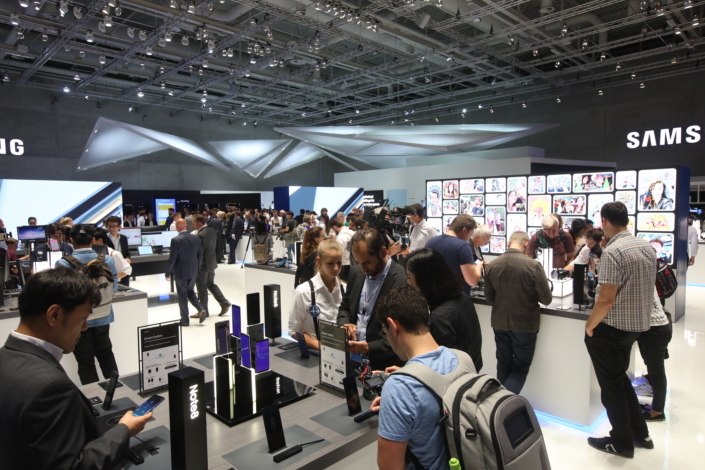 IFA attendees put the Galaxy Note8’s IP68 water and dust resistance to the test by snapping selfies and dunking the device at the Portrait Pool. The Galaxy Note8 boasts a wide array of compatible accessories, including various covers, wireless chargers and external batteries. 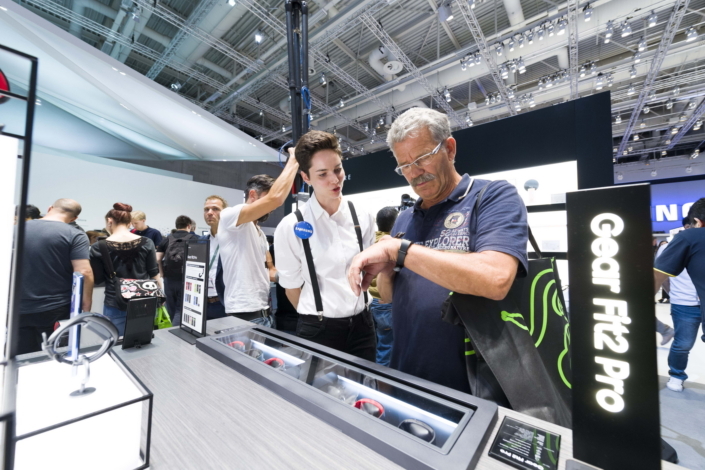 Attendees get hands-on with the new Gear Sport smartwatch, which features a sleek and versatile design, including a wide range of band options, and premium health- and fitness-management functions. Samsung’s Gear Fit2 Pro, a water-resistant GPS fitness band, has been enhanced through partnerships with Under Armour and Spotify, and comes preloaded with Speedo’s best-in-class swim-tracking app, Speedo On. Samsung’s update of its cord-free Gear IconX earbuds, which allow users to stream music from their phone and also function as a standalone music player, features improved battery life and a new integrated Running Coach with a voice guide that offers real-time updates on workout progress. 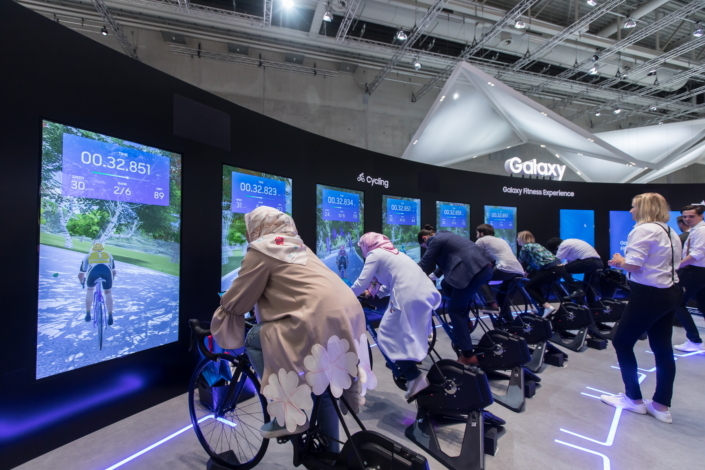 The Gear Sport’s dedicated fitness zone invites attendees to test out the smartwatch’s exercise-tracking functions properly: by strapping it on to take part in fun cycling and rowing competitions. 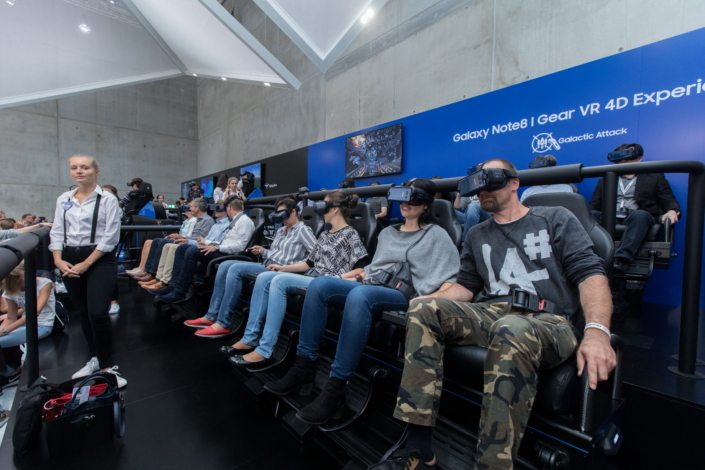 Attendees donning Samsung’s Gear VR with Controller take part in immersive intergalactic battle in the 4D VR Theater. 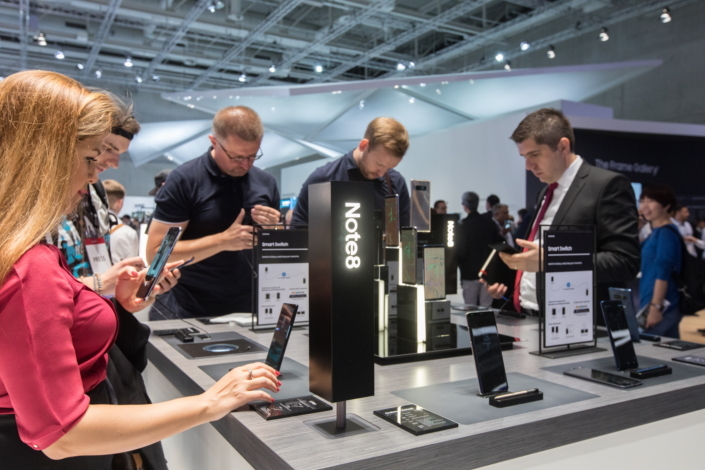 The booth’s Workplace section showcases various ways that enterprises can utilize Samsung’s latest mobile innovations, including the Galaxy Note8 and Galaxy Book, to streamline how they do business.